This is KJW's newest release with the best features you'll ever look for in a pistol. Its has the power, light trigger pull, accuracy, reliability (full metal and CO2 ready), hi-capa (30+1 rd capacity), railed frame, Tanio Koba upgraded grip and fully reinforced internals and external parts. Besides performance, the look and feel is rated top notch making this pistol one of the best gas pistol you can buy for Airsoft training and simulation. Many products that we sell may be shipped directly from a distributor or manufacturer that does NOT provide live inventory. Items will ALWAYS be listed as "in stock" unless otherwise noted. Please contact our retail store for the latest product inventory. KENTUCKY RESIDENTS. 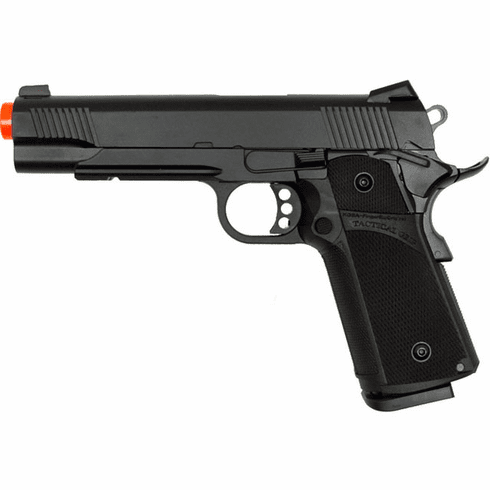 You must be 18 years of age or older to purchase any Airsoft Replica from BG Airsoft. While the sport of Airsoft is designed to be enjoyed by all ages, ignoring proper safety practices can turn a day of fun into a tragedy. Todays modern airsoft guns are capable of firing a BB at velocities that can and will penetrate fabric and skin, causing serious injury. Always wear "Full Seal" eye protection and observe proper weapon handling practices such as keeping the weapon on "safe" and cleared with the magazine out to prevent accidental discharge. REMEMBER!! Safety begins with the shooter!! Copyright � 2011 BG Airsoft. All Rights Reserved.